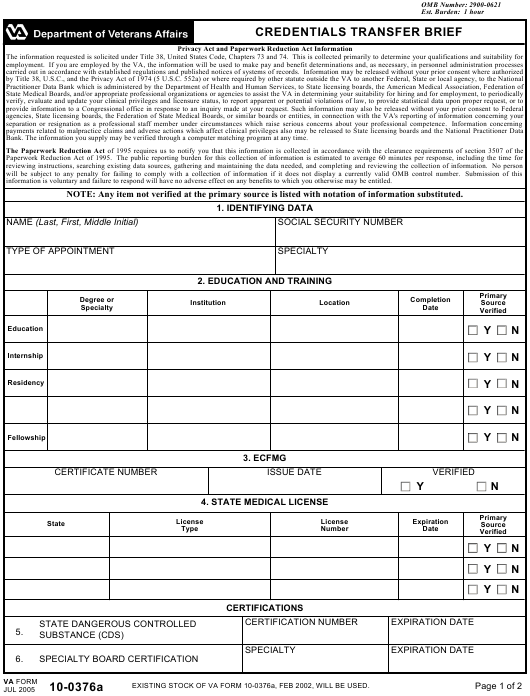 VA Form 10-0376a or the "Credentials Transfer Brief" is a form issued by the United States Department of Veterans Affairs. The latest fillable PDF version of the VA 10-0376a was issued on July 1, 2005 and can be downloaded down below or found on the Veterans Affairs Forms website. Bank. The information you supply may be verified through a computer matching program at any time. information is voluntary and failure to respond will have no adverse effect on any benefits to which you otherwise may be entitled. NOTE: Any item not verified at the primary source is listed with notation of information substituted. EXISTING STOCK OF VA FORM 10-0376a, FEB 2002, WILL BE USED. competence to perform granted privileges.